Isn’t this how problems are usually solved? You study the problem, consider the issue from all angles, perhaps even try a few solutions, but you never quite get it right till you walk away and then come back to the problem again later (okay, not always, but sometimes that’s true, and it was definitely true with respect to this long-sought-after recipe). Overnight method – combine oats with water, egg, sugar, salt, and cinnamon in a large bowl, cover and refrigerate overnight. In the morning, preheat oven to 350 degrees, add milk and baking powder to the oats, and pour into an 8×8, 9×9, or pie pan. Bake for 25 minutes, till brown on top. Morning method – combine oats with water and boil till water is absorbed. Pour oats into a large bowl, add milk, sugar, salt, and cinnamon. 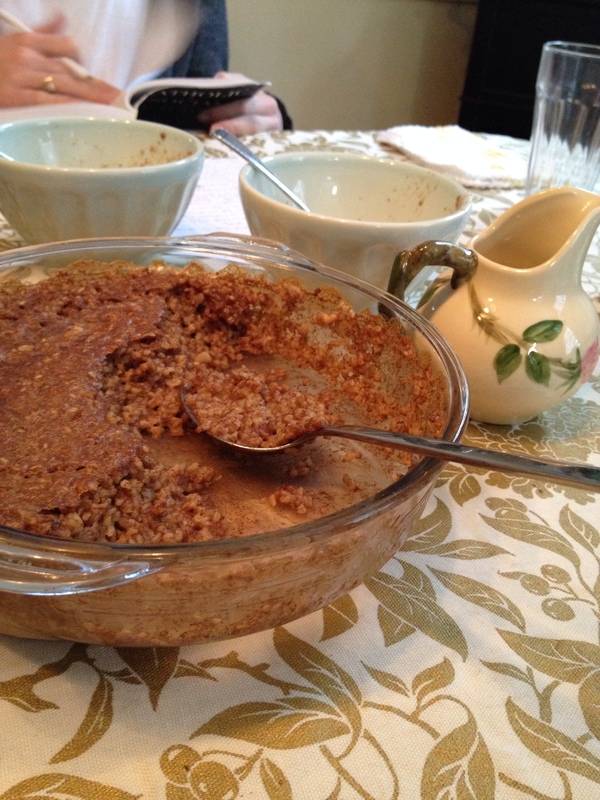 When oat mixture has cooled somewhat from mixing the other ingredients, add the beaten egg and the baking powder. Pour into baking dish and bake at 350 degrees for about 25 minutes.